Mom & Dad Know What They Are Doing /Hawks Aloft Inc. Written by Lisa Morgan, Raptor Rescue Coordinator. 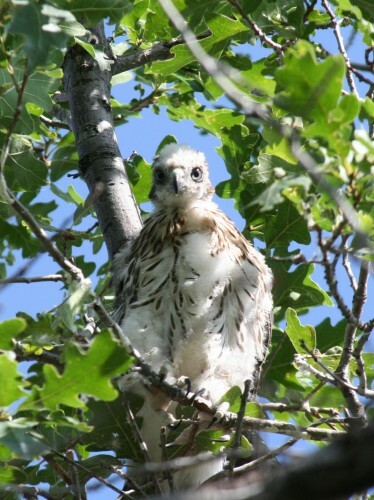 On June 7, we received a call from a retirement community in Rio Rancho about FIVE Cooper’s Hawk chicks that had been blown out of a nest high in a cottonwood tree. Two chicks survived the fall. 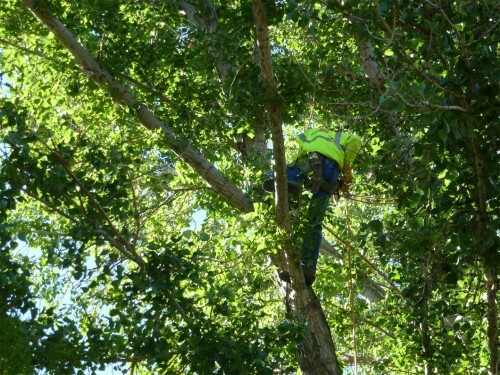 We determined that the best option was to return the chicks to the cottonwood tree where their parents could continue caring for them – even though we could never locate the nest. With the help of PNM Resources, and their tree climbing crew, Trees, Inc., we set about making an artificial nest in the tree from whence they came. The crew first installed a human-constructed nest consisting of a wicker basket and natural nest lining materials. Trees, Inc. staff installing the wicker basket nest. Image by PNM Resources. Once the nest was thoroughly secured in the tree, it was time to hoist the nestlings back up and into their new home, where their parents still waited even though it had been four days since the chicks were taken. 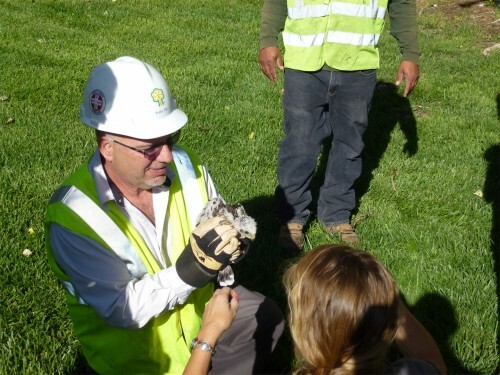 Bob Mongiello prepares to return a Cooper’s Hawk nestling to its new nest. Image by PNM Resources. The two chicks settled right into their human-constructed nest, just as if they had always been there. Dad Cooper’s Hawk even attempted to deliver food to his chicks while all this was in progress, although he was frightened off by all the commotion. 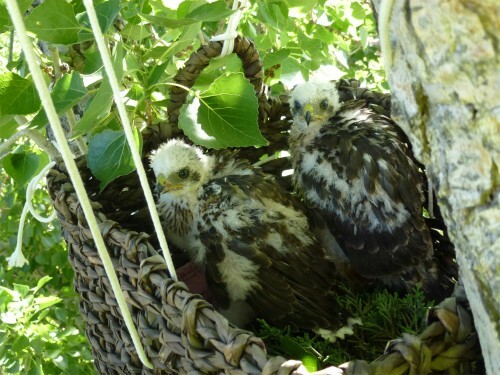 Re-nested Cooper’s Hawk chicks. Image by PNM Resources. The biggest issue we contended with was concerned citizens that continued trying to come to the aid of these chicks, disturbing their parents’ attempts to care for them. In the end, it was a successful return once we were able to educate the neighbors about the privacy needs of the hawk family. Although it can be difficult to watch these youngsters on the ground, in nearly all cases it best to allow the families to stay together and the parents to continue caring for their youngsters. We thank PNM for allowing the use of their tree-climbing crew, Trees, Inc. We also thank PNM Resources staff: Thad Petzold, Ryan Baca, John Acklen, Stephen Saletta, and Bob Mongiello.